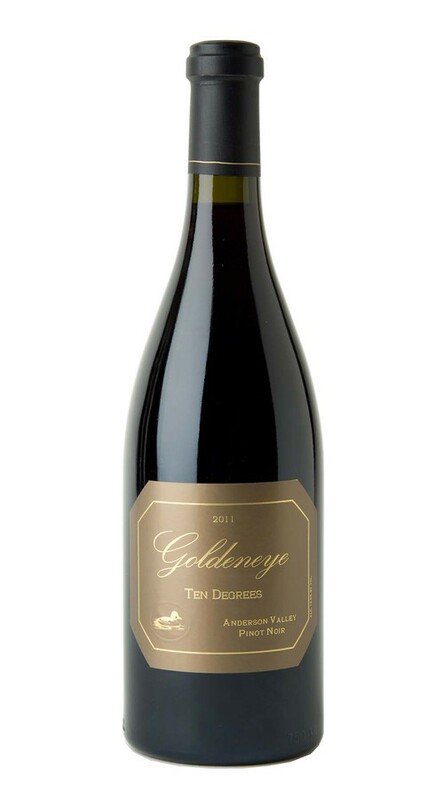 The name Ten Degrees pays homage to the unique, cool climate of the Anderson Valley and the fact that even though our four estate vineyards span a modest eight miles, they often display a temperature variance of as much as 10 degrees from The Narrows Vineyard in the cool “deep end” to our Confluence Vineyard in the south. To add to this natural climactic diversity, our Estate program consists of 200 acres and more than 96 individual blocks of Pinot Noir with 49 unique combinations of clone and rootstock material. Embodying the best of the best from our estate program, this stunning wine combines the lithe, elegant red fruit, conifer notes and silky tannins of our Confluence Vineyard, the opulent dark fruit, leather and spice of our Gowan Creek Vineyard, the structural elements and wild berry and cracked pepper notes of Split Rail, with the vivid blue fruit, earth and lavender character of The Narrows. Supple, super complex and supported by sweet and toasty French oak flavors, this is a profound and powerful expression of Pinot Noir.